Ok guys, let me warn you about something now: it’s possible that I went a teensy bit overboard with pumpkins in today’s post. But in my defense, I was overly excited about having my beloved card catalog in our dining room and I just couldn’t help myself. Do you remember my card catalog–the one I scored for way cheap at a local antique store a while back? Well we actually just moved it out of our front room and put it in our dining room last week. I was hoping to do some kind of awesome DIY project with it, like possibly make it into a coffee table, but that didn’t really work out like I planned so it’s in our dining room for now. And honestly, I kind of love it like it is. I can move it from room to room whenever I want and it’s seriously the funnest thing ever to decorate. 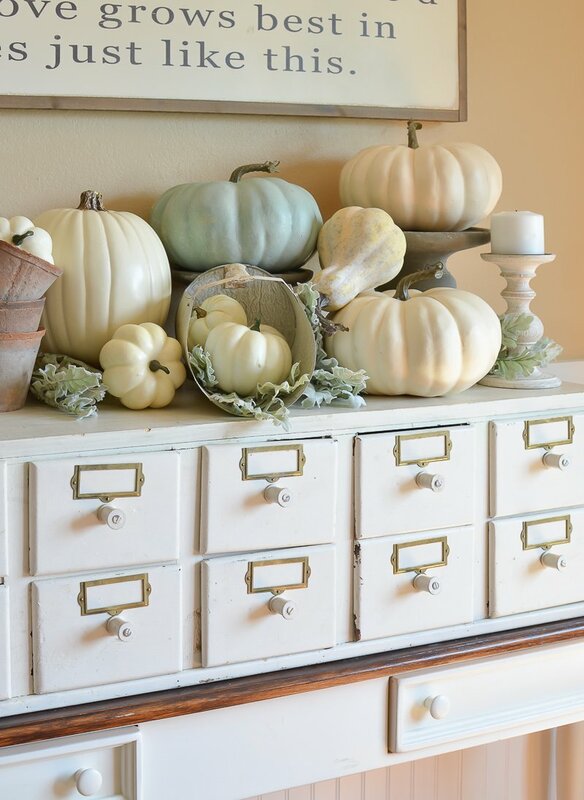 Really, I am borderline obsessed with this card catalog and I’ve been anxiously awaiting the day I could decorate it with pumpkins. Well that day has finally arrived and I’m tickled pink to show you guys what I put together! Isn’t it cute?! 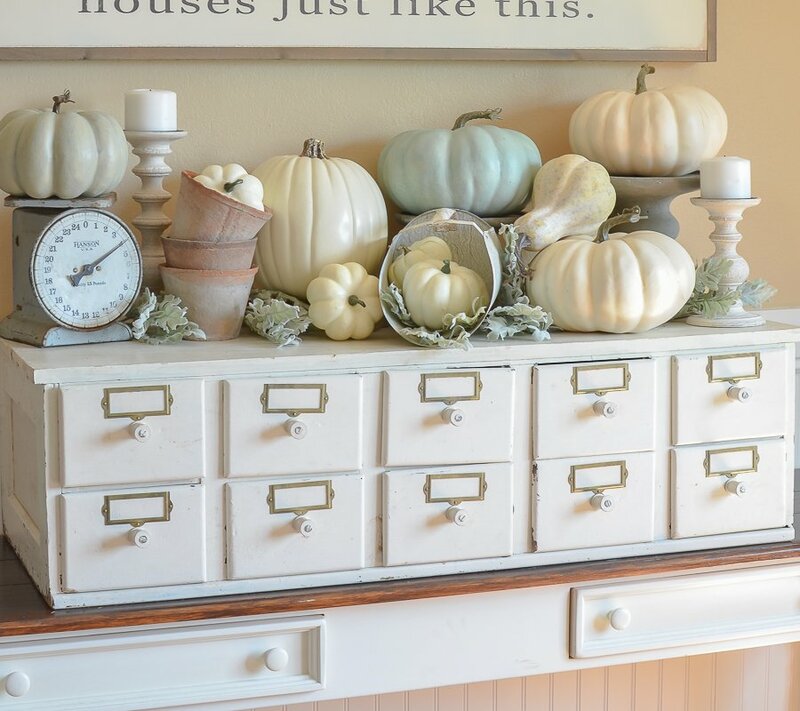 It’s like this card catalog was made for pumpkins. And I think the key with a look like this is adding in different heights and textures. That really helps to add variety and keep it interesting. And do you guys remember that grain scoop I shared in my Friday Favorites post last week? 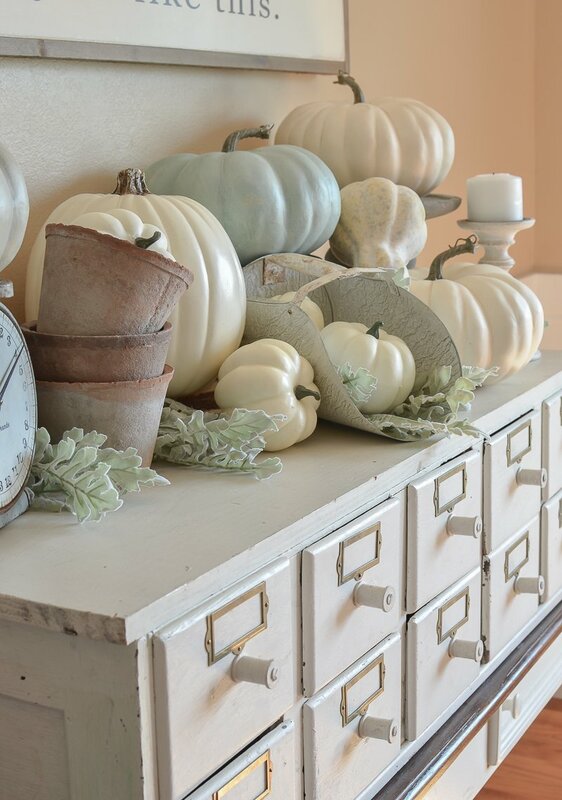 Well I snagged it when I was styling this spot and I just couldn’t help but put a few little baby pumpkins in it. Who knew a grain scoop would have so many possibilities!? I love that little guy. I always get all of my faux pumpkins and greenery at Michael’s. And I usually buy the dusty miller in large bundles, then cut it down with wire cutters so I can use the individual leaves wherever I want them. That makes one bundle go a lot further and it’s also handy when it comes to putting a look like this together. I had so much fun putting this all together and I hope it gave you a few ideas for your own home. 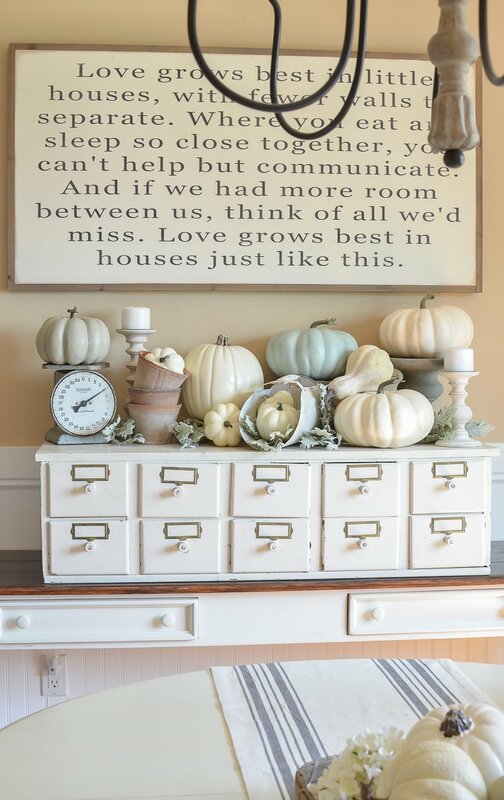 Decorating for fall is one of my favorite things to do–it just makes the house feel so cozy and warm. 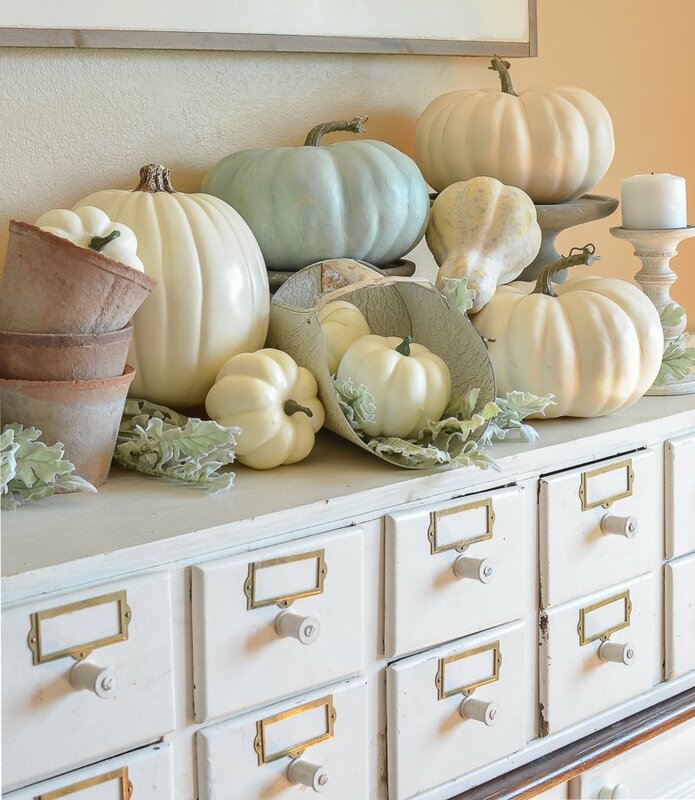 And even though I may have gotten carried away with all these pumpkins, I’m actually loving how this card catalog looks for fall. I tell ya, this guy is super fun to decorate and play around with–it’s definitely one of my favorite purchases EVERRRRRR. Well my friends, that’s a wrap for today. I can’t wait to show you how the rest of our dining room is looking. Remember how I told you that we sold our table a while back? Well after weeks of looking I just couldn’t find anything I really loved to replace it. So we actually moved the table from the breakfast nook in here and I really like how much more space we have in here now. And yes, that means I had to get a new table for the breakfast nook, but that all actually worked out really well. I’ll be sharing all those updates soooooon! Another beautiful post. Love it!!! 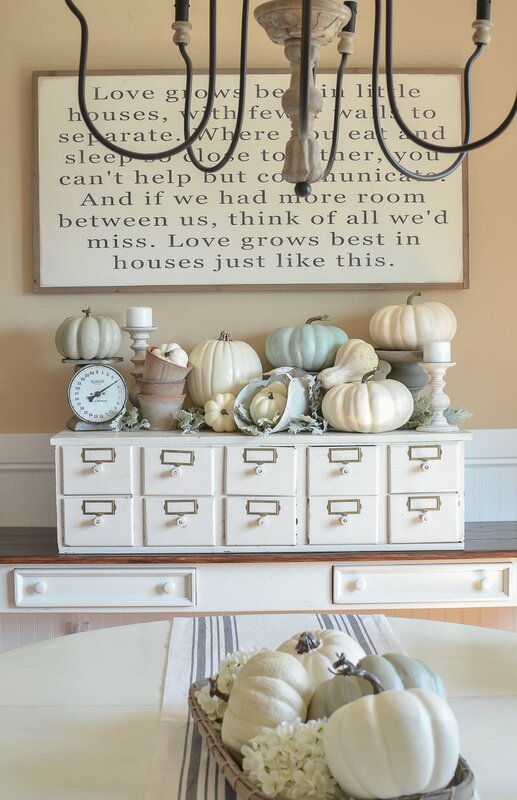 My philosophy is you can’t have enough pumpkins, so I am loving this decor. 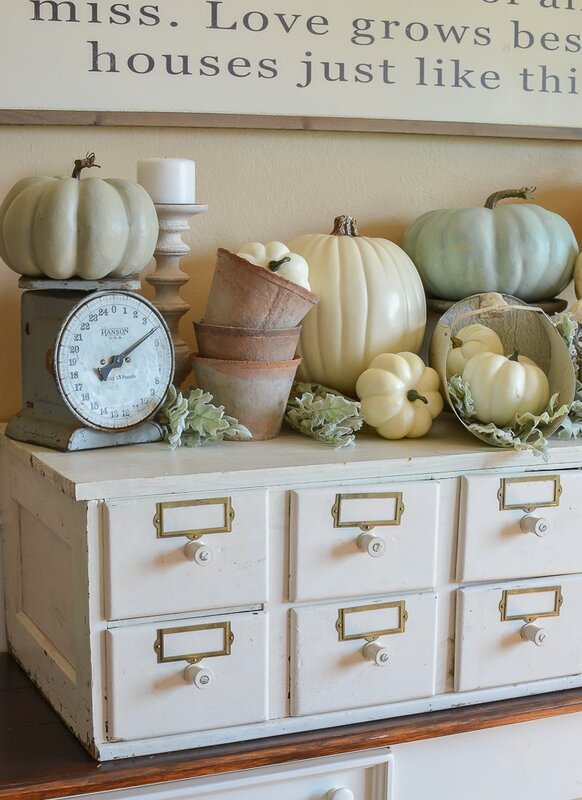 I’m thinking I need me some of that dusty miller~ your card catalog fits in there so nice too. A person just has to smile looking at that spot! I love this card catalog display! Did you paint your pumpkins? It’s pumpkin season! You can’t go overboard! And the table runner is on sale RIGHT NOW FOR LIKE $9! Amazing! Thanks Nikki!! I sure do love that card catalog. One of my favorite finds ever! I LOVE this!! I just finished painting some dollar tree faux pumpkins that I can’t wait to style around my apartment! That’s a great idea Alyssa, I need to try that! So adorable. Love the colors! Aw that sign! It’s one of my all-time favorites. It’s adorable I’d love to own one of these , beautifully decorated. Thank you Teresa! I’m so lucky to have found this card catalog for a decent price. Oh my heart…that card catalog is amazing. I’ve been looking for one for so long. What a great score. It looks simply amazing with the pumpkins. Perfect for fall! Thanks Chelsea! I still can’t believe I found this for such a great price. Such a lucky find! That’s a lot of pumpkins! It looks great. I have a new mantle on my fireplace. You’ve given me some good ideas. Oh yep, this could totally work on a mantel too. Have fun with it! I love this, Sarah! 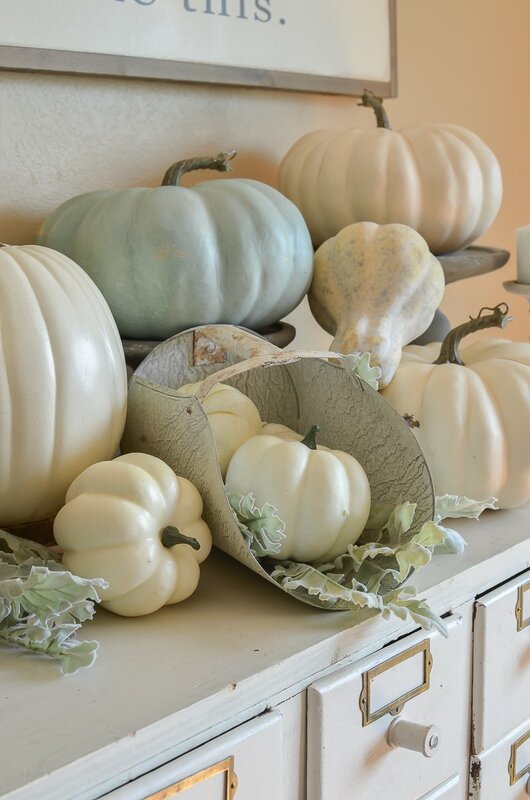 Some places call you to go crazy with a look…pumpkins, florals, whatever, and other times a subtle touch works. I am so excited now to get some pumpkins!! So cute. Did you paint this card catalog? It is so fun. Exactly Jane! 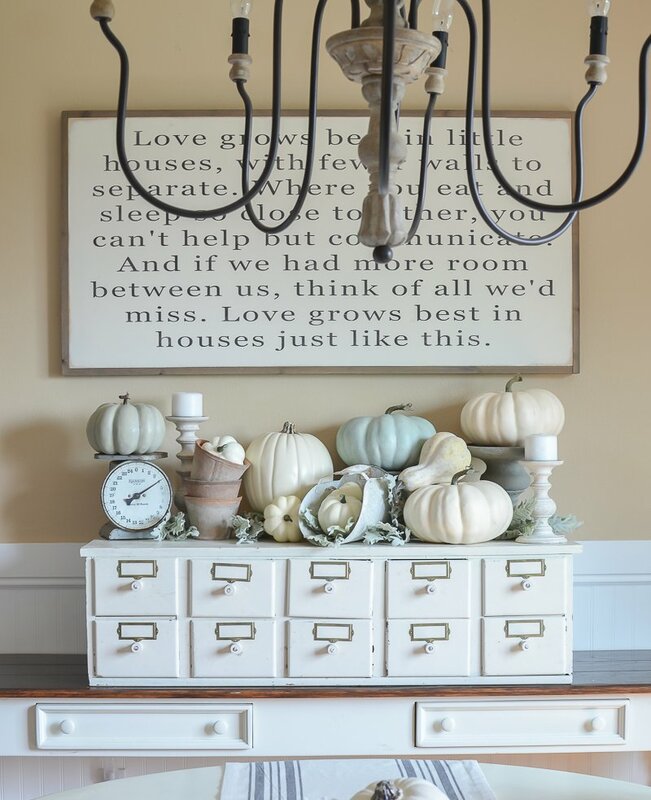 Sometimes a girl just needs to use all the pumpkins 🙂 And no, I didn’t paint the card catalog. It was like that when I bought it! Are the pumpkins real or fake. They really look nice I can’t tell. I am afraid it is to soon to use real ones. I absolutely love your taste ! !